Time tracking is the essential evil to time billing, if it’s not done properly your profits could be dwindling awayâ€¦ Missing hours equals less profit. Below Left: This is a great snapshot of who is working in your company. 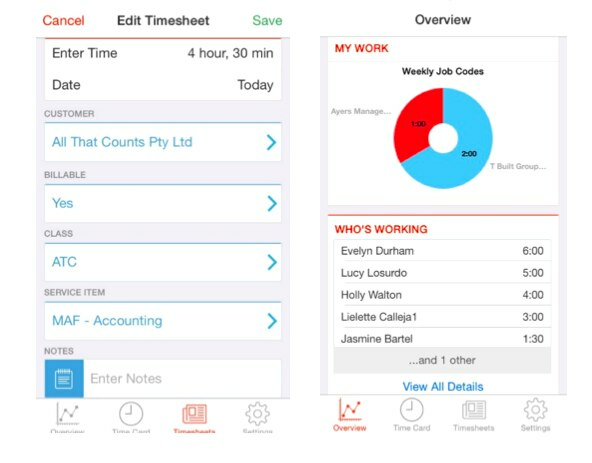 The iPhone time tracking app gives you an overview of the hours worked for the current pay period plus an overview of hours worked by you the business owner if you are logging time. Above Right: The iPhone time tracking app syncs with your QBO data (Customer List, Classes, & Services) it’s definitely our preferred method of tracking time. Seriously Easy & Simple! If you would like more information on how TSheets + QBO could work for your business we would love to speak with you or jump right over to Tsheets.com and check it out yourself.